I love showing off the many benefits and highlights of living in Fishtown, and the extensive list of restaurants within walking distance is always the first thing I boast. When my husband and I take friends out, Loco Pez never fails to impress; their kitchen is speedy, and the food is phenomenal and reasonably priced. With a group of people, though, we face a predicament: do we order our usual number of tacos and risk looking like gluttons? Joe and I easily eat eight tacos each and leave feeling satisfied, not stuffed. It’s hard to hold back from ordering more, so we’ve learned our lesson and share chips and guacamole, too. In a group setting, we first attempt to read our dinner-mates to see how comfortable we can be – Do we order our usual? Should we play it safe and order four tacos each? What if we’re still hungry? In the end, our appetites usually conquer our doubt and we convince our dinner companions to not be shy and follow suit. 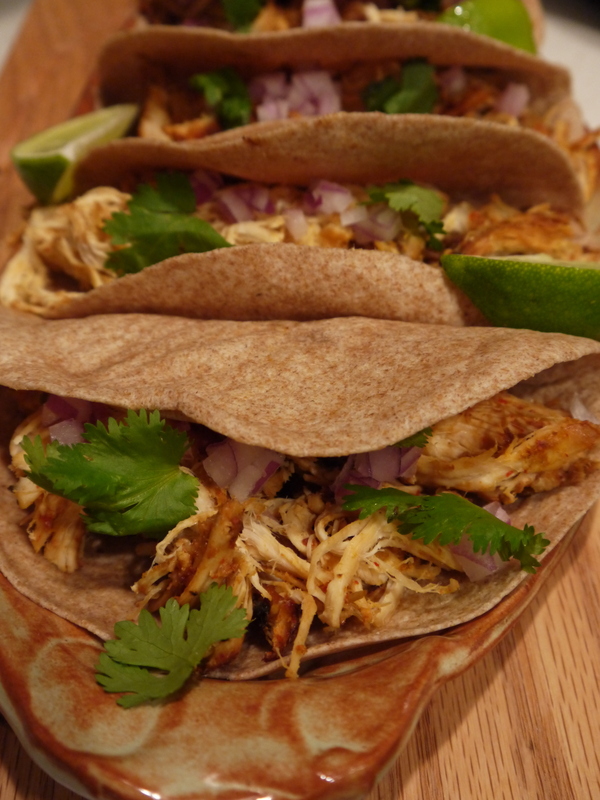 This slow cooker recipe produces a slightly spicy shredded chicken reminiscent of the amazing pollo taco at Loco Pez. A homemade version of one of my favorites, I could stuff my face without thinking twice. Place chicken in large freezer bag. Combine juice, lime juice, garlic, chili powder, cumin, oregano, salt and pepper in a large bowl. Add to bag with chicken and refrigerate; marinate at least 4 hours. Place the chicken in the slow cooker along with the mixture of the orange and cook on low until tender, about 6-8 hours. Shred the chicken, mix in the juices, spread the mixture in a single layer on a baking sheet and broil until it starts getting crispy, about 5 minutes. Assemble the tacos on the tortillas with the chicken carnitas along with the onions and cilantro and serve with the lime wedges. Chicken carnitas, made in the slow cooker. I could eat, like, eight of these. Sure, the time it takes for the chicken to linger in the marinade plus the time it takes to cook in the slow cooker is significantly longer than it takes for me to walk from my house to Loco Pez and eat my eight tacos, but it’s time well spent. It’s hard to believe the dynamic flavor comes from a simple combination of citrus and spice – smoky cumin and orange juice make quite the pair. Topped with crunchy red onions, fresh cilantro and a squeeze of fresh lime juice, I could eat about ten of these and, since I can make them at home, I won’t have to worry about the stares and judgmental glances.